Balti Chicken Curry with Simple Rice Pilaf! 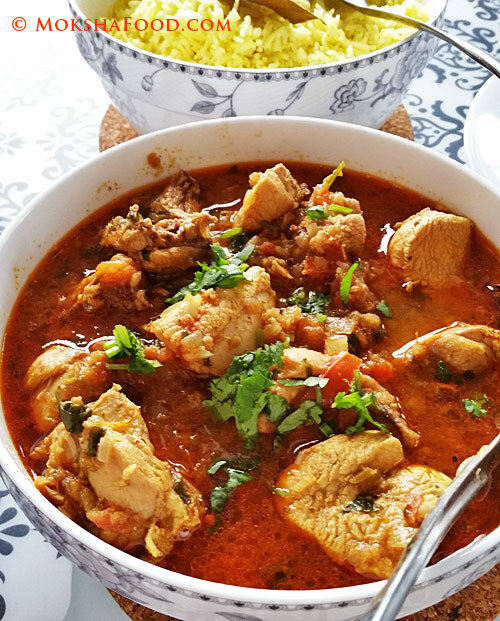 Balti Chicken Curry is a very simple preparation which can be easily made with regular staples in your pantry. Its the quality of spices used which makes this curry so flavorful. The dried fenugreek leaves/ kasuri methi are a must as they impart a depth of flavor to this curry. Balti Chicken is considered to have originated from Baltistan in northern Pakistan. Its said to have made its way to Birmingham, UK by way of immigrants. Its here that this dish was reinvented and popularized. It has now become one of Britain's favorite curries. "Balti Houses"- restaurants exclusively serving this dish are very popular in Birmingham. Balti Curry- could also get its name from the container its usually cooked or served in. Its a round bottom iron kadhai/wok with 2 handles on each side. Balti in urdu/ hindi usually means "bucket". There are many variations of this recipe. I have adapted it from a "Balti house" chef from here. 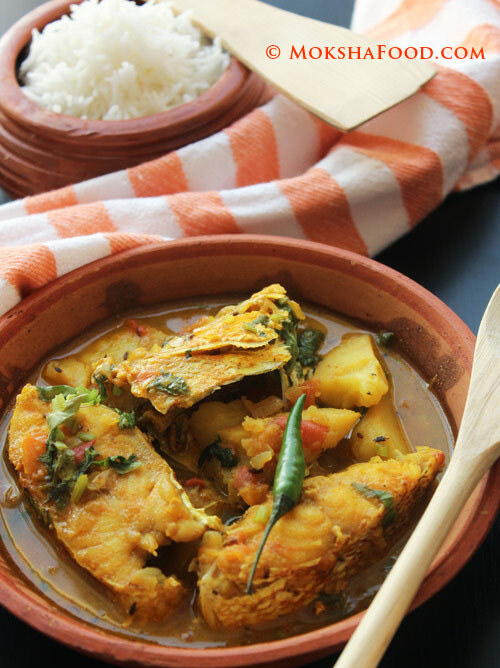 Bengali Fish Curry/ Macher Kalia! Even before my in-laws visit us this summer, I have been subconsciously cooking more Bengali food to get comfortable with it. I am really excited and looking forward to learning many more Bengali recipes and becoming a pro at it. If there's one skill I lack, that is making their Mishti/ sweets. Hopefully I gain some skill and churn out some decent desserts. 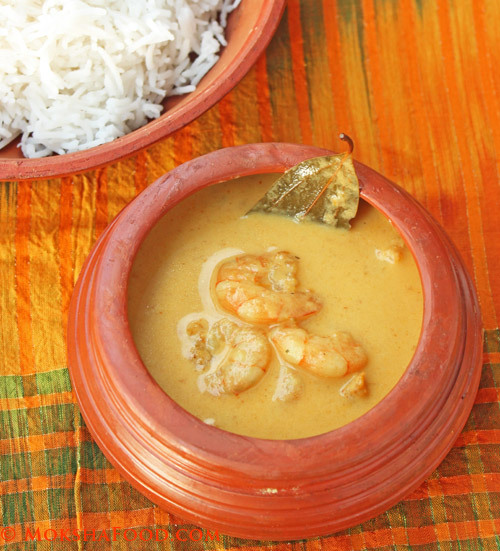 Macher Kalia or Bengali fish curry is a mildly flavored fish curry with an unusual combination of ingredients -mustard oil and cardamom seeds. Cardamom is considered as a sweet spice and used mainly in Indian dessert preparations. But in this curry, it gives a nice pleasant undertone and cuts the sharpness of mustard. What happens when a Konkani marries a Bengali? The coconut is at war with the mustard! That's what happened when I got married to my Bengali hubby. We both were foodies and were raised eating traditional food. We had a strong preference or aversion towards certain ingredients. He didn't fancy grated coconut based curries and I couldn't stand the smell or taste of mustard. We had to rely on some common favorites - Punjabi and South Indian food to get past our initial hurdles. We craved for our own comfort foods. Life became even more challenging when we moved to another country. We struggled to adapt to a new culture, new cuisine and new people. Somewhere going along, we learned to accept and enjoy the variationsof cuisines and cultures. Now 12 years down the line we have learned to appreciate and tolerate the numerous differences within us.